So what is Cinematic Thunder? 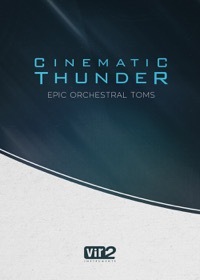 It's a collection of huge orchestral tom drum sounds ready to go for your next epic trailer piece. Seriously, it's a collection of huge orchestral tom ensemble/group and solo hit patches. If you've ever heard a movie trailer or epic chase scene...then that's what you will be reminded of with this library. It's ready to go in Kontakt Player so you do not need the full version to use it. This thing sounds huge! But it's not just huge sounding, the drums hit hard! So it's a great combination of huge sounding drums that have major impact. Being able to go into the interface and tweak mic levels, effects, and humanization just adds to the realistic sound. Overall I think it starts with really great source recordings, I think they did a good job capturing something that many of us would never be able to capture ourselves. They also presented it in a way that makes it super simple to use, just load and go, no need to really think about any special articulations or parameters, it's all right there for you to to play. At the end of the day all the extra options are cool, but really it just sounds awesome out of the box. If you need these types of sounds, big, epic, trailer style drums, then you definitely want to check this out. I give Cinematic Thunder 5 out of 5 subs, it sounds amazing and it's just super simple to use with a slick interface that allows you to quickly tweak to taste. I know there are many such libraries around, but sometimes you just need something that is straight forward, sounds great, and gets out of the way to let you do your thing. They did a great job of offering something super powerful that is also deadly simple to use.